We have all have Mondays like that. And sometimes Wednesdays too. Really, it doesn’t matter what day it is. There are chores and kids and families and jobs and projects and deadlines and field trips and birthday parties and appointments and fevers and sports and thunderstorms and whatever else fills our days. On Monday, my phone was dinging with texts between phone calls and I was scribbling new things on my calendar. And then I remember what really matters: God wants to transform me. It’s an ongoing, everyday process. And it doesn’t always means the Creator of time lets me in on the information and plans I want. I love thinking about how God is the perfecter of our faith. We can’t be perfected – as in the maturing process – without submitting ourselves to God. Although that’s indeed such a relief for those of us who want to keep trying to be better and do more, it’s still hard. It still requires approaching the throne of grace over and over and over and over again. Especially on Mondays that offer surprises for the week. Especially on Wednesdays that have us weary. Especially on the weekends when we embrace rest. And that’s the transformation that matters, the one that changes us from the inside out. In other words, focus on God and he’ll perfect you — perfect as the verb, not the adjective. I'm so sorry Kate has strep! And did I see that you may have it too? Prayers for all to be well quickly! After having kids I had to make peace with the fact that my days and weeks were no longer going to look the way I thought they would. Looking back now I see what a refining process those days were, still are! I do love that version of one of my favorite verses. Thank you for these thoughts on letting God perfect us! 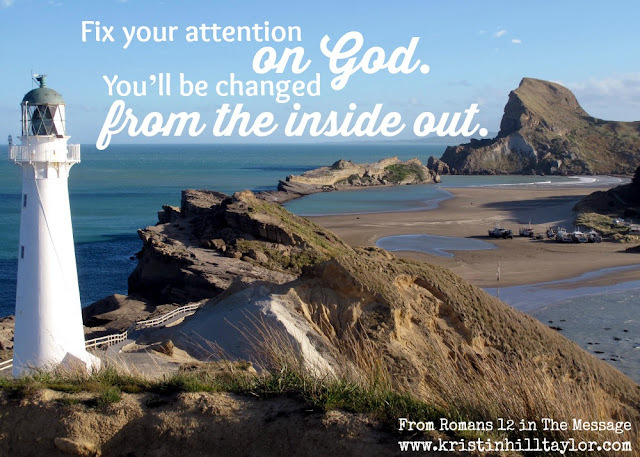 Kristin, one of my prayers when praying for people is, "Might information become revelation." Because THEN it changes people!!! Ah, I love that and may be using that too! Thanks for sharing that here, Susan! Health is much improved here. These Kentucky allergies are messing with my head, but it's getting better. And Cate is back to herself too. Thanks for being here with kind words. Love you, friend. I thought I might have strep too, but I don't. I just have a head full of congestion from Kentucky allergies. This happens every year. Ugh. And Cate is better, so that's good. Yeah, kids certainly help with lessons in letting go of control and expectations! :) Nothing has been as sanctifying as motherhood has been for me! I'm glad you got some down time. Hope your people stay healthy - these allergies are crazy right now. This transformation message is one I need to remind myself of, so I'm glad you were encouraged too. I can really relate to this right now. God is refining me. I'm wanting to "get it" you know - like really come away with what he wants me to understand about him and about me in relation to him. I totally get wanting to get it. That's where I am too, my friend. Transformation is what gets each one of us closer to Jesus. I think if the lessons He wants us to learn were easy, we wouldn't get as much out of them. I know this is true for me. He is the perfecter of my faith. Love your graphic, Kristin. Has me dreaming of the beach. Hope your daughter is feeling better. You're right - we wouldn't hold onto the truth if it was easy to come by. That pictures in my graphic is from Castlepoint, New Zealand - such a beautiful place I got to visit in August 2009. It's what came to mind this week when I wanted a pretty image. :) Glad you're here, Kim! I'm right there with you - seeing my natural tendencies and the blessings God gives when we lean in. We're feeling better around here, thankfully. So glad you're here, Tiffany! "Transformation is greater than information." As one who loves information, I have to remind myself that not only do I not need to know everything, I'm better off learning to live with the unknown and the unexpected. It forces me to depend more on the Lord. Amen. I'm right there with you learning (and appreciating!) that. Thanks for coming here, Lisa!